While planning the construction of the Psych / PTOT project at Children’s of Alabama, the COA team realized that capturing existing conditions would be difficult without additional technology. The team purchased a laser scanner to scan all of these conditions and create a 3D Point Cloud of the facility. In under a week, the team scanned all of the demolished areas and stitched all of the scans together to create the 3D point cloud. 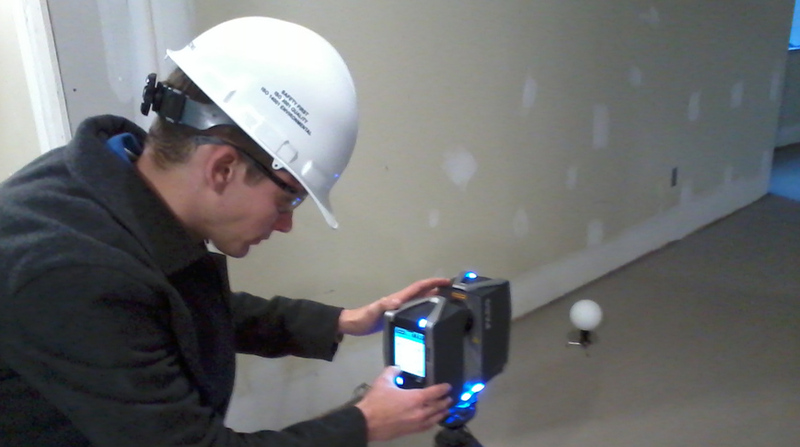 The image above shows Zac Meadows setting up the laser scanner. The white sphere on the floor is a datum point used to tie multiple scans together like front sites and back sites on a survey traverse. The image below shows the end product of a laser scanner, the 3D Point Cloud. The point cloud was then inserted into the coordination model allowing all of the team members to coordinate the design and construction within the context of the existing building. The image below shows the 3D Coordination Model inside the point cloud. Conduit, Duct, Walls, Lights, Hydronic Piping, Plumbing, and Structure were all coordinated without the need to make repeat visits to the job site to measure and capture existing conditions. The team was able to make decisions in the coordination meetings instead of needing to delay decisions until someone could go out to the jobsite to measure and model the existing-to-remain project scope. This level of coordination would have been impossible without the laser scanner. The BIM team can laser scan large portions of your project in a matter of hours or a couple of days depending on the amount of scope of the project.